I am and always have been passionate about empowering clients to create and maintain healthy boundaries so they can have a limitless life. I help clients develop a strong self-esteem and deep self-love so they can express and live their heart’s truth. I work with people who want to heal, grow, connect to their passion and feel alive. My clients believe I am a pretty cool, totally down to earth, a spiritually empowered person and talented coach who has helped them to achieve their goals. Check out my Client Successes page to read what they have said about me. I intuitively inspire life and love transformations through one on one coaching, group classes, sacred circles and retreats. I am Board Certified by the American Association of Drugless Practitioners. I received my Master’s degree from New York University. I have acquired certifications in Positive Psychology Coaching, Spiritual Life Coaching, Neuro-Linguistic Programming, Infinite Possibilities Training, Reiki Master and Teacher, Quantum Touch, Vibrational Medicine, Spiritual Response Therapy, Soul Coaching® Master Oracle Card Reader and other healing modalities. I am also a Universal Life Church Minister and a Red Hot Visionista Leader. 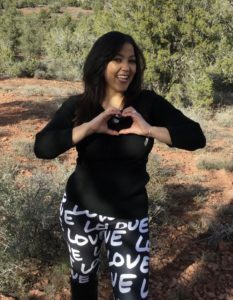 My articles have been published in Wisdom Magazine, Inner Realm Magazine, Self-Growth.com, LOVEolution.com, and the book “Navigating 2012.” I am currently writing a book I intend to publish in the very near future. I am also a psychic intuitive and medium. My guidance is received through various senses but my strongest senses are claircognizance and clairsentience. My other senses are utilized when appropriate. I am also an empath. I have been right where you are in this moment. I was frustrated about my life and I didn’t have healthy boundaries. I felt overwhelmed about the direction of my life and relationships. I felt scared and alone. I sought out help and after several years of traditional therapy I decided I wanted something that would get to the heart and soul of the issue. I was very drawn to nontraditional healing methods and modalities and non-religious spiritual teachings. After years of healing, researching, training, coaching and continuing to learn through experiencing life and relationships in a whole new way, I have found the key to attracting and creating the life and relationship of my dreams! My LIFE lessons (personal and professional) were all about learning to love myself in a way that no one ever did or could in that moment. I realized that in order for me to attract and manifest the Life and Love of my dreams, I had to fall in love with me, know myself inside and out and be confident in my abilities and myself. I was born and raised in Brooklyn, NY. I moved to NJ with my son, Michael, in 2008. My parents were both born in Puerto Rico. I am fluent in English, proficient in Spanish and dabble in Romanian and Italian languages. I love music, dancing and singing. I love to read, swim in the ocean, walk in the park, pet my cat, meditate and practice yoga. I have also worked at financial, educational, and various nonprofit institutions. My spiritual name is Trinity. I received this name during a yoga retreat in Tulum, Mexico in 2009. A spiritual name is a tool that helps to elevate one’s energy through the divine essence of its meaning. Trinity became my spiritual or soul identity. It challenged me to live consciously and remind me that I am a creator of my world. I made the choice to receive a spiritual name to take the step of leaving old patterns and beliefs behind and connecting with my infinite self. I currently live a conscious daily life and so I don’t utilize my spiritual name as I did when I first awakened to my spiritual self. I now use my birth name Diana to remind me that I am still having a human experience. Many clients who have known me for years still call me Trinity and it is a wonderful prompt from spirit of who I really am and how much I have learned, experienced and grown. Are you a new client? Would like to sample my services? Do you have a yearning to shift your life? Do you crave to see what’s possible with being loved unconditionally and loving life with your whole heart? Are you ready to take the next step to having fun and bringing joy back into your life? Create a crystal-clear vision for the kind of life or relationship that you’d like to attract and have. We’ll uncover hidden challenges that may be sabotaging your successes with life or your relationships. You’ll leave the session feeling renewed, re-energized and inspired to take the next step to creating the life and relationships of your dreams.